On June 20, we kicked off our six-week Exploring Words Summer Camp with an age-old debate: are sharks or dolphins cooler? 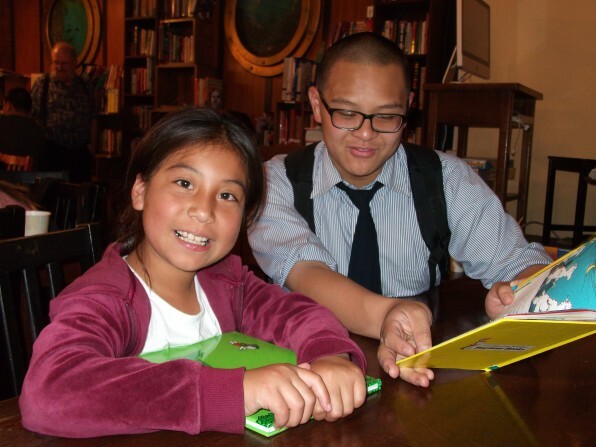 This summer, we’re partnering with Mission Learning Center to offer our annual intensive reading and writing experience for students entering grades two through six. The theme for this year’s camp is similarities and differences, and students will focus on a different comparison each week. So far we’ve written about carnivorous sharks, dolphin princesses, and bizarre hybrids of the two. We’ve debated about which animal, in the long run, is better. In the upcoming weeks, students will complete experiments, chapbooks, plays, newspaper articles, and cartoons about the similarities and differences of healthy food and junk food, planets and stars, and other surprising things just waiting to be compared. In addition to reading at MLC and working with tutors to write at 826, students spend two hours a day in Dolores Park with Playworks, a nonprofit organization that aims to increase opportunities for physical activity and safe, meaningful play.